Oyster Bay has become a living, thriving work of art! 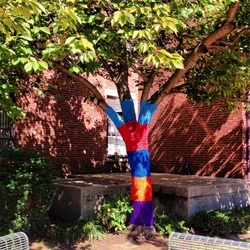 Several months ago, OBMSA and the OB-EN Chamber of Commerce teamed up with the Knitted Purl and world-renowned fiber artist Carol Hummel to design and execute the first ever fiber arts installation of this size on Long Island! Since December 2013, hundreds of volunteers - of varying ages and experience - have been meeting in locations all over Oyster Bay for "crochet boot camps." Together they successfully crocheted over 2,000 yards of craft cord into the colorful panels you see throughout the downtown! Finally completely installed, we would like to thank all of our hard working volunteers and many many sponsors for making this entire installation possible and helping us raise $1,000 for the Youth and Family Counseling Agency of Oyster Bay. We invite everyone to enjoy the new colorful look of the downtown before it is removed in the Fall! Since December 2013, hundreds of volunteer hours have been put into crocheting the pieces that adorn the trees, light posts and information kiosks of our downtown! There were many crochet bootcamps hosted by various groups in different locations around the downtown including the Knitted Purl, Dodds & Eder, Cantebury's, The Madd Potter, the Oyster Bay Historical Society and Not Just Art! We are so thankful for the support of our volunteer "Hookers" and businesses!